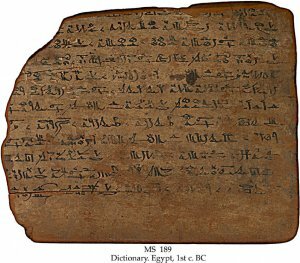 Description	 MS in Middle Egyptian on wooden board, Egypt, 1st c. BC, 1 board, 16x13 cm, single column, 12 +10 lines in Hieratic script. Provenance	 1. Charles Ede, London (ca. 1980-1986); 2. Bernard Quaritch Ltd, London (1986); 3. Moulton Collection, USA (1986-88); 4. Bernard Quaritch, London. Commentary	 Under publication by Professor W.J. Tait, University of Durham. This text is of considerable interest. It is the only text of its kind in Egypt, and throws new light on words and their meanings. Many words included are rare with hitherto unclear meaning, which now has been clarified. It is also extraordinarily late for the use of Hieratic script.